This content was published: May 25, 2011. Phone numbers, email addresses, and other information may have changed. Sylvania's ASPCC is a co-sponsor of the May 28 "Stand Up for Peace" comedy show. The “Arab Spring” under way has elicited a renewed interest and need for peace in the Middle East and North Africa – and if laughter is the best medicine, maybe the first step toward peace could be through it? The Sylvania Campus’ student government (ASPCC) thinks so and has joined forces with a variety of other organizations to co-sponsor “Stand Up for Peace” (www.standupforpeace.com), a free comedy show featuring the talents of two nationally recognized stand-up comedians, Dean Obeidallah and Scott Blakeman. “Stand Up for Peace” is a disarmingly funny performance that brings Jews, Arabs, Muslims and people from all backgrounds together to laugh, and encourages a dialogue. The event will take place at 7 p.m., Saturday, May 28, Portland State University (1835 SW Broadway), in the ballroom of Smith Memorial Student Union (Room 355). Tax deductible donations will be accepted on site to support the PSU International Student Emergency Relief Fund. 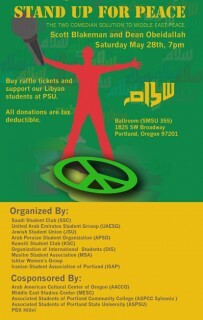 “Stand Up for Peace” is organized by the Saudi Student Club, United Arab Emirate Student Group, Jewish Student Union, Arab Persian Student Organization, Kuwaiti Student Club, Organization of International Students, Muslim Student Association, Ishtar Women’s Group and Iranian Student Association of Portland. The event is co-sponsored by the Arab American Cultural Center of Oregon, Middle East Studies Center, Associated Students of Portland Community College (Sylvania), Associated Students of Portland State University and PDX Hillel. For tickets contact Kate Chester, community relations manager at the Sylvania Campus, at (971) 722-8233, or call (503) 725-3307. 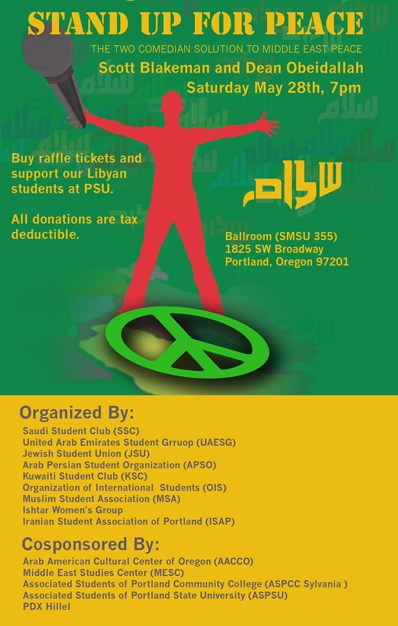 For additional questions, get in touch with Kanaan Kanaan, PSU’s Middle East Student Advisor, at (503) 725-4101.